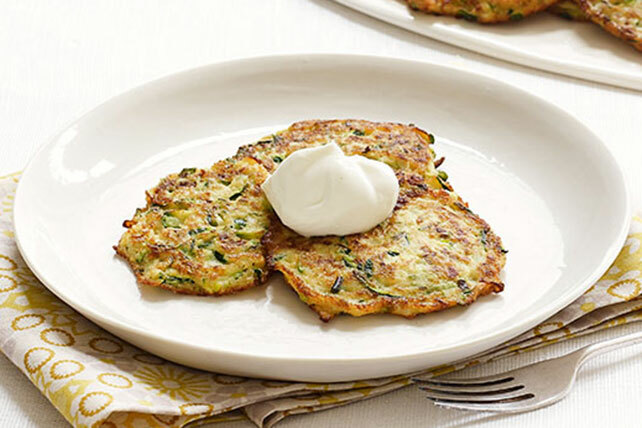 Toss grated zucchini with eggs, Parmesan & crackers for Zucchini Pancakes. Cook in skillet. Top with sour cream. Serve up Zucchini Pancakes—and take a bow. Use hands to squeeze as much liquid from zucchini as possible. Place zucchini on double thickness of paper towels; drain. Whisk eggs in medium bowl until blended. Add onions, cheese and pepper; mix well. Stir in zucchini and cracker crumbs. Heat oven to 225ºF. Heat 2 tsp. oil in large nonstick skillet on medium heat. Spoon about 3 Tbsp. zucchini mixture into skillet; flatten with back of spatula to 3-inch round. Cook 3 min. on each side or until golden brown on both sides. Place on ovenproof platter; place in oven to keep warm. Repeat with remaining zucchini mixture, adding remaining oil as needed. Serve pancakes topped with sour cream. Serve with a seasonal fruit salad.